I discovered last night that sweet and sour cocktail mix is nothing more than simple syrup and citrus juice. Are you all rolling your eyes at me? Seriously, I don’t know what I thought was in there, but I certainly didn’t realize it was so easy. Homemade sweet and sour mix! In seconds! I decided to celebrate this discovery with a cocktail! Voila! The key lime amaretto sour. I didn’t know that either… thanks – now I don’t have to wait for my husband to run to the store if I want a cocktail. Oh yummy! 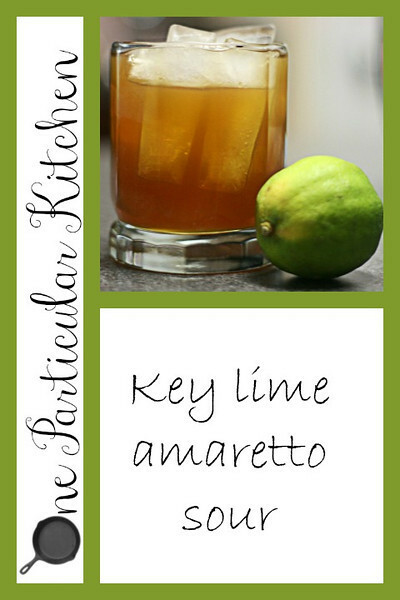 I love amaretto sours, but this makes it so much better with key lime! Great discovery! Nice, sours of all stripes are the bomb. Heh, I hadn’t realized that was all sour mix was either. It’s a gorgeous and simple drink. Love it, especially made from scratch like this! I hate those awful sour mixes that so many ppl buy in the store…. Oh yum! I’d take one of those!